Wimbledon is done and dusted, and The Ashes have been won. So now it’s time to pull on your boots and hit the hills. We recently contributed some car-free routes to the Independent’s feature on ‘The 50 Best Summer Walks’. If you missed it in print, you can read our suggestions online. In other news, Green Traveller have put together an excellent guide to going car-free in the UK’s national parks. No walks included, but then we’ve got those covered already. Shropshire has many fine hills. The Long Mynd and Wenlock Edge are well known, but there are plenty of quieter options, such as this walk over Little Caradoc and Caer Caradoc. 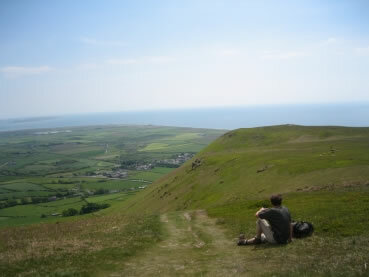 Black Combe in the Lake District and Great Whernside in the Yorkshire Dales feature in our latest blog offerings. A cracking prize for our July to September draw – two customized waterproof maps,courtesy of Aqua3. Winners will create their own maps by choosing exactly where they want the centre to be. To enter, submit a walk before the end of September 2013. Congratulations to Steve Cumber, the winner of the Alpkit Base 120 sleeping mat in our last prize draw. The Rail Rambles June to December programme is now out, with an excellent selection of long and short routes from stations around Wales and the border counties. To see what’s coming up, visit their website. The next newsletter will be out in October (ish). Please send us any news and until then, enjoy the summer!